We have over 3,000† marriage and civil partnership related appointments every year – that’s around 125 couples every month. We have advertising notice boards and leaflet holders at certain registration offices (PDF, 200KB). 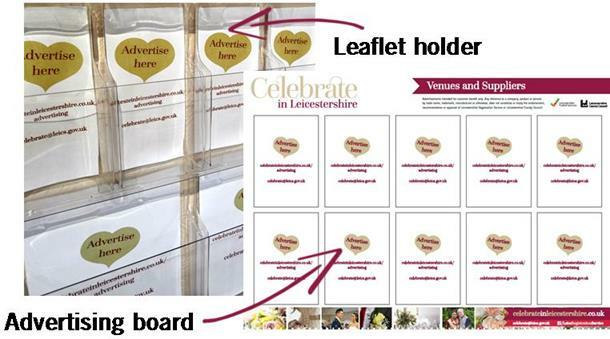 The notice boards can display A4 posters and the leaflet holders are suitable for various sizes of leaflets or brochures. You have to supply the material*, but we do offer a competitively priced design and print service. Discounts are available for purchases of 3 or more slots in the same transaction. We have glass display cases at certain registration offices (PDF, 200KB). This type of advertising is great if you want customers to see your product physically – e.g. stationery, photographs or flowers. You can even set the display up yourself*. Read the Office advertising terms & conditions (PDF, 2MB). Contact us with your requirements and we can check availability and provide a free quote. We will reserve your booking and ask for a copy of your artwork/material to check. If we are happy, we will contact you to finalise payment and provide delivery instructions for the remaining material. †Total number of notice of marriage/civil partnership appointments, civil partnership to marriage conversion appointments, and pay and discuss appointments in 2015/16 (across all offices). *For notice board and leaflet holder advertising, you will be given an address to deliver your material to. For glass cabinet advertising, you can visit the office to set up on the first day of your term. Delivery/P&P costs are at your expense. 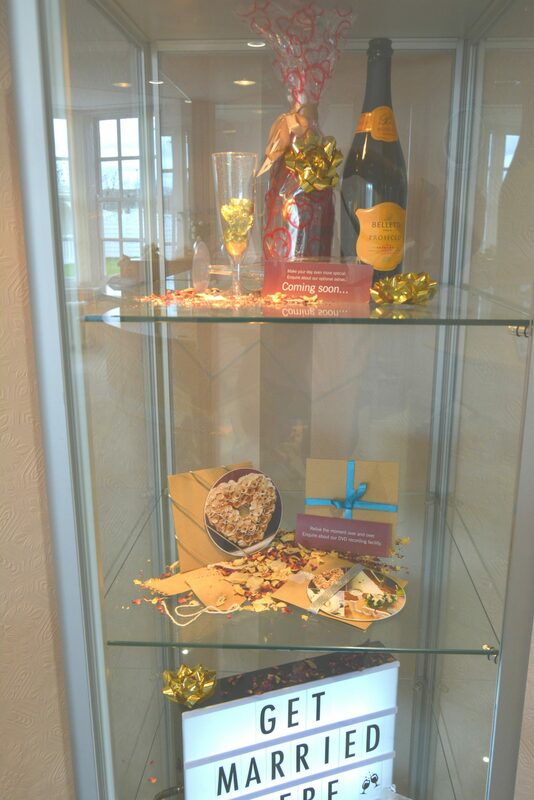 **A “slot” is classed as either ONE space on the noticeboard, ONE space (regardless of size) in the leaflet holder, and ONE shelf in the glass display cabinet. Each office has a limited number of slots and is subject to availability. ^Prices subject to review/change. Prices are inclusive of VAT.